On 26 November 2018 CNIC held an international symposium in collaboration with the Institute for Peace and Cooperation, Korea, as part of a research grant from the MacArthur Foundation, USA. 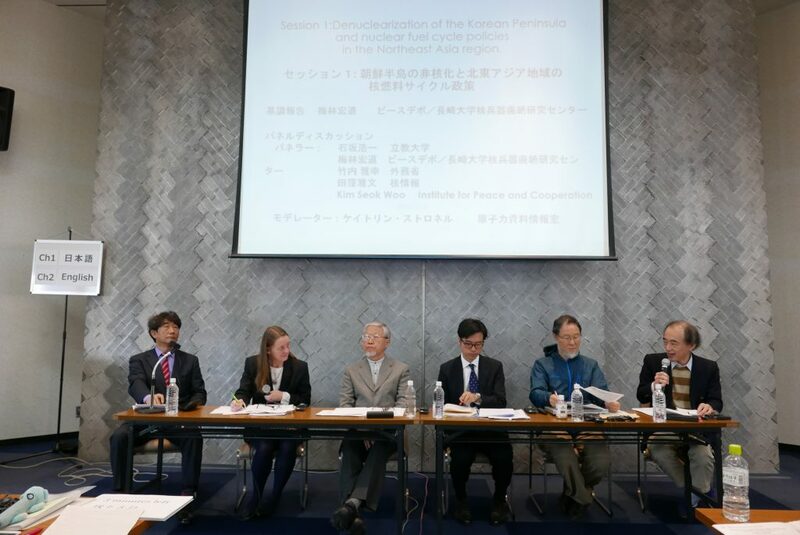 There were two sessions in the day-long symposium and speakers from Republic of Korea (ROK), United States (US) and Japan gave informative presentations followed by lively discussions in the expert panels and with participants from the floor. The following day (November 27), speakers held a morning session at the Diet Members Building, where a condensed version of the previous day’s discussions was presented to Diet members, their staffers and the media. The symposium speakers from Korea gave a clear outline of the present situation regarding the pyro-processing program in their country and the myriad problems of the reprocessing program in Japan, including the massive plutonium stockpile and the failure of the MOX program, were highlighted by other speakers. Alternatives to reprocessing, such as direct disposal of nuclear waste, were also explained. 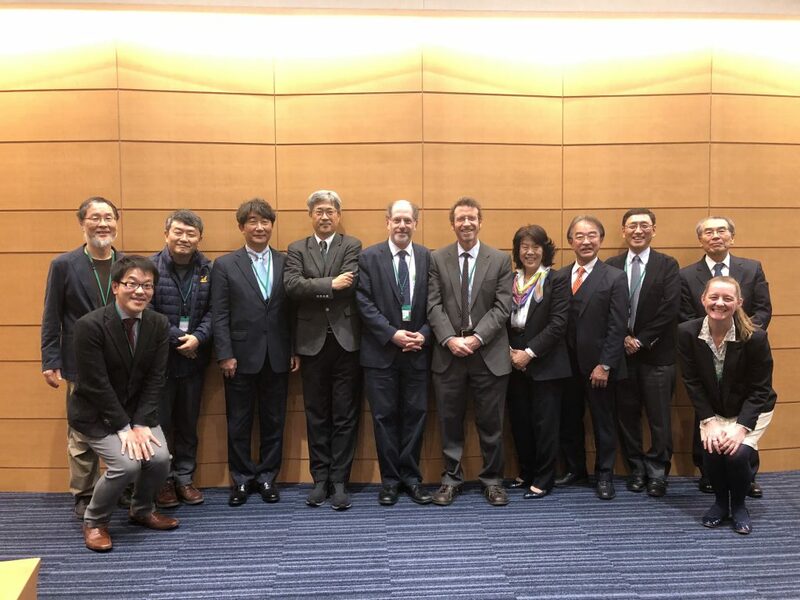 A strong appeal was made to end nuclear fuel cycle policies in both Japan and Korea, especially in the present context of denuclearization of the Korean Peninsula. If there is to be a real chance of peace in the Northeast Asian region, plutonium and the potential to separate it must be eliminated. The first session of the symposium dealt with impacts of nuclear fuel cycle policies on the present moves to denuclearize the Korean Peninsula. The session opened with a keynote speech from Umebayashi Hiromichi who is a Special Advisor, former President and Founder of Peace Depot Inc. and Visiting Professor at the Research Center for Nuclear Weapons Abolition, Nagasaki University (RECNA). Umebayashi outlined the history of the North Korean (Democratic People’s Republic of Korea-DPRK) nuclear program, emphasizing that DPRK established its weapons program in self-defense, to counter the perceived threat from the US. In January this year, DPRK judged that it had achieved this goal in nuclear weapons development and switched to a policy of diplomacy, leading to Summits, first between the leaders of North and South Korea and then between the US and North Korean leaders. This has opened up an epoch-changing chance for a new future in Northeast Asia. But this chance can only be realized if the denuclearization process is considered in tandem with US security guarantees to DPRK. Umebayashi gave us a concrete example of ‘phased, reciprocal steps to denuclearization’ which would build mutual trust, crucial to any peace process. He suggested that establishing a Nuclear Weapon-Free Zone (NWFZ) would be a concrete way of addressing both issues of denuclearization and security guarantees and that it would need to cover the entire Northeast Asia region, including Japan, Russia and China as well as North and South Korea and the US, in order to be stable. In this zone, the non-nuclear states (Japan, North and South Korea) would pledge not to hold, develop or manufacture nuclear weapons and the nuclear-armed states (US, China and Russia) would pledge not to attack or threaten the non-nuclear states with their weapons. There would be verification systems put in place to make sure everyone was obeying the NWFZ treaty. After the keynote address, a panel discussion took place. On the panel were Takeuchi Masayuki, Principal Deputy Director, Non-Proliferation, Science and Nuclear Energy Division, Disarmament, Non-Proliferation and Science Department, Ministry of Foreign Affairs (MoFA); Ishizaka Koichi, Associate Professor at Rikkyo University Institute for Peace and Community Studies and Takubo Masafumi, operator of Website Kakujoho (nuclear information). Kim Seoc Woo from the Institute for Peace and Cooperation also joined us to give a perspective from South Korea, replacing our planned speaker, Seok Kwanghoon, who was unable to attend. Takeuchi gave us a clear picture of the Japanese government’s stance on both DPRK and on the issue of plutonium. Regarding DPRK, he explained that basically, Japan couldn’t offer any sort of cooperation because DPRK were violating United Nations resolutions by pursuing their nuclear program. This view was criticized by Umebayashi because it ignores the reason why DPRK violates the UN resolutions, which is because they were threatened in the first place. Ishizaka also pointed out that DPRK has expressed concern about Japan’s massive plutonium stockpile, which they could also see as a threat, so removing the stockpile would be one way to show that Japan is willing to build trust and move ahead. In any case, nothing is going to begin if Japan’s stance remains so rigid. Regarding plutonium, Takeuchi explained that the Japanese government has pledged that it will not keep excess plutonium and that it will use all it has for peaceful purposes. The government is committed to reducing the present plutonium holdings and MoFA will work with other relevant ministries to ensure that this happens. Japan complies with all IAEA inspections and rules and has approved security management; thus Japan is meeting all its obligations in terms of the international community. This view was questioned by Takubo who mentioned a particular instance of concern expressed by a US State Department official. 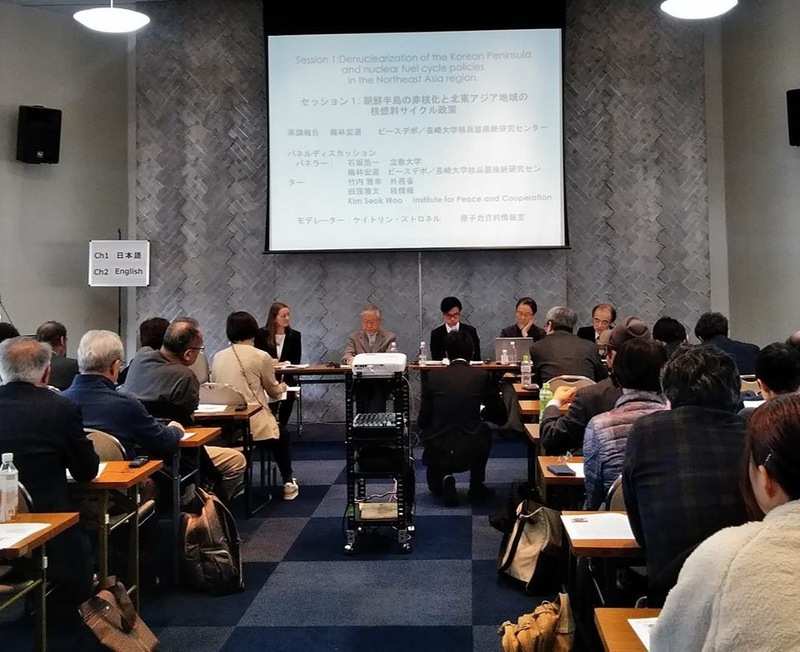 The point is that the international community may not be concerned that Japan is now considering using its plutonium in nuclear weapons, but by holding it, the international community may have concerns about future policies in Japan. It also sets a bad precedent for other countries and can lead to, if not an arms race, certainly a plutonium race in neighboring countries. Takubo also made the point that the US State Department had intense negotiations with Japan in 1987, trying to discourage Japan from reprocessing, but it did not prevail in the face of Japan’s determination to pursue this policy, resulting in an institutional reluctance to reopen the debate. If Japanese people were to express strong opposition to reprocessing and this was to make any sort of impact on the government, the US may feel it possible to push harder to discourage reprocessing in Japan, but in the absence of this support, it is very difficult for them to do so. Kim commented that in Korea, it was also difficult to raise awareness of citizens regarding the government’s pyro-processing policy, which could lead to plutonium separation. The scientists at Korea Atomic Energy Research Institute (KAERI), where the research is being conducted, have packaged pyro-processing as ‘recycling’ and claim it will reduce nuclear waste. These claims are also made by the government in Japan, and therefore countering these claims in a way that the general public and lawmakers can understand is an important challenge for movements in both countries. The second session focused on the actual situation regarding pyro-processing and reprocessing in Korea and Japan and concrete alternatives to disposing of plutonium and nuclear waste. Hwang Yongsoo, Senior Vice President at KAERI, opened the session by giving an introduction to the present situation in Korea, explaining that the new government has a policy of transitioning out of nuclear energy, which means that South Korea will have less spent nuclear fuel (SNF) to dispose of than previously planned. Various alternatives are being investigated and most probably dry storage will be installed at sites both at and away from the reactors. Final disposal is to be decided by the Public and Stakeholder Engagement (PSE) process. The first round ended last year without conclusion but a new round will be conducted in 2019. However, due to the difficulty of finding final disposal sites of a suitable size in Korea, research on pyro-processing is being conducted to reduce the footprint area of a deep geological repository and also to isolate transuranic elements (TRUs) to manufacture fresh fuel for sodium fast reactors. This research is being carried out jointly with the US and will be completed in 2021. Following Hwang’s introduction, the panel consisting of Alan Kuperman from Texas University, Edwin Lyman from Union of Concerned Scientists, CNIC’s Ban Hideyuki and Kim Seoc Woo had some quite technical discussions on the points Hwang raised, firstly, regarding reduction of the footprint area of nuclear waste through pyro-processing. As Lyman pointed out, because using plutonium as fuel means that the spent fuel is at a much higher temperature and must be loaded further apart than uranium fuel, it doesn’t save space at all. Hwang agreed with this point, saying that saving storage space for waste in dry casks would not be a good reason to pursue reprocessing. Regarding the higher costs of using MOX fuel, Hwang explained that the fuel is such a small percentage of the cost of a nuclear plant that it doesn’t make a very big difference to the overall costs and is not such a major consideration. However, Kuperman clarified this by saying that the largest cost of a nuclear reactor is the construction cost and when this is being paid off, the fuel is a low percentage of the total cost. After the construction cost has been paid off, however, the fuel cost becomes a larger percentage of the operating cost and it becomes significantly more expensive for utilities to use MOX. Furthermore, the sodium fast reactors which Hwang mentioned are the most expensive reactors, and therefore using the most expensive fuel and the most expensive reactors does not make any sense. Ban pointed out that there are so many hidden costs associated with nuclear power generation, especially regarding disposal and decommissioning, that it can be very deceptive to say that the added cost of reprocessing is insignificant. Lyman offered some concrete alternatives for how Japan might dispose of its 48 tons of separated plutonium, based on US experience. He commented that direct disposal methods are more secure than MOX production and irradiation. 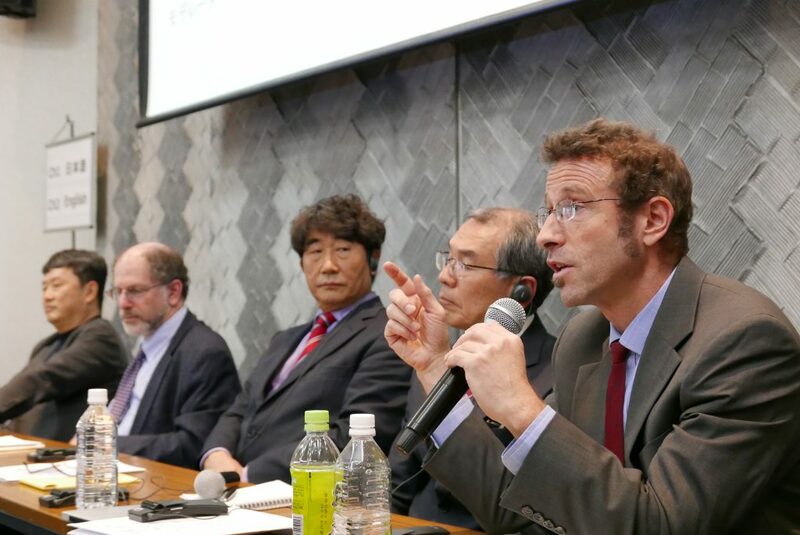 Kuperman spoke about the failure of MOX programs on a global scale and that the Japanese MOX program would also fail to reduce Japan’s massive plutonium stockpile. He also made concrete suggestions, for example, that Japan should pay the UK to dispose of the 22 tons of plutonium which Japan presently holds there. Kuperman said that one of the important reasons why such an irrational practice as reprocessing continues is that no one wants the nuclear waste in their backyard. People near the reactors don’t want it stored there and people in Aomori don’t want it stored permanently in their prefecture either. Without addressing this waste disposal problem openly, honestly and transparently, irrational ‘solutions’ such as reprocessing will continue. The conclusion of the session was that there are no perfect solutions, but because there are already large quantities of spent fuel in existence, the ‘least worst’ solution must be determined. Hwang said that while scientists and experts can do research and come up with suggestions, it must be citizens who make the final decisions about where and how spent fuel is disposed of. It is the responsibility of both scientists and civil society to inform citizens about the choices they can make in a way they can understand.